Be ready to answer these frequently asked interview questions. Too many job seekers stumble through interviews as if the questions asked are coming out of left field. But many interview questions are to be expected. Study this list of popular and frequently asked interview questions and answers ahead of time so you'll be ready to answer them with confidence. "What are your weaknesses" is one of the most popular questions interviewers ask. It is also the most dreaded question of all. Handle it by minimizing your weakness and emphasizing your strengths. Stay away from personal qualities and concentrate on professional traits: "I am always working on improving my communication skills to be a more effective presenter. I recently joined Toastmasters, which I find very helpful." Answer "Why should we hire you?" by summarizing your experiences: "With five years' experience working in the financial industry and my proven record of saving the company money, I could make a big difference in your company. I'm confident I would be a great addition to your team." By asking you, "Why do you want to work here?" the interviewer is listening for an answer that indicates you've given this some thought and are not sending out resumes just because there is an opening. For example, "I've selected key companies whose mission statements are in line with my values, where I know I could be excited about what the company does, and this company is very high on my list of desirable choices." When you're asked, "What are your goals?" sometimes it's best to talk about short-term and intermediate goals rather than locking yourself into the distant future. For example, "My immediate goal is to get a job in a growth-oriented company. My long-term goal will depend on where the company goes. I hope to eventually grow into a position of responsibility." If an interviewer asks, "Why did you leave (or why are you leaving) your job?" and you're unemployed, state your reason for leaving in a positive context: "I managed to survive two rounds of corporate downsizing, but the third round was a 20% reduction in the workforce, which included me." If you are employed, focus on what you want in your next job: "After two years, I made the decision to look for a company that is team-focused, where I can add my experience." The interviewer who asks, "When were you most satisfied in your job?" wants to know what motivates you. If you can relate an example of a job or project when you were excited, the interviewer will get an idea of your preferences. "I was very satisfied in my last job, because I worked directly with the customers and their problems; that is an important part of the job for me." 7. What can you do for us that other candidates can't? Emphasize what makes you unique when you're asked, "What can you do for us that other candidates can't?". This will take an assessment of your experiences, skills and traits. Summarize concisely: "I have a unique combination of strong technical skills, and the ability to build strong customer relationships. This allows me to use my knowledge and break down information to be more user-friendly." 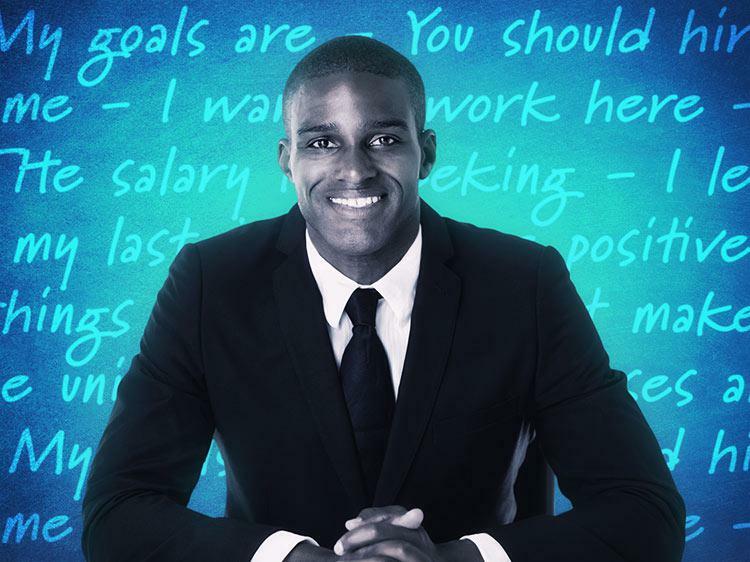 It's time to pull out your old performance appraisals and boss's quotes to answer the question, "What are three positive things your last boss would say about you?". This is a great way to brag about yourself through someone else's words: "My boss has told me that I am the best designer he has ever had. He knows he can rely on me, and he likes my sense of humor." When you're asked, "What salary are you seeking?" it is to your advantage if the employer tells you the range first. Prepare by knowing the going rate in your area, and your bottom line or walk-away point. One possible answer would be: "I am sure when the time comes, we can agree on a reasonable amount. In what range do you typically pay someone with my background?" Don't be alarmed if you're asked, "If you were an animal, which one would you want to be?" Interviewers use this type of psychological question to see if you can think quickly. If you answer "a bunny," you will make a soft, passive impression. If you answer "a lion," you will be seen as aggressive. What type of personality would it take to get the job done? What impression do you want to make? One last question for you: Are you looking for more ways to stand apart from the competition? Of course you are. Join Monster today. As a member, you'll get career advice and useful tips sent directly to your inbox. It's a quick and easy way to stay one step ahead.